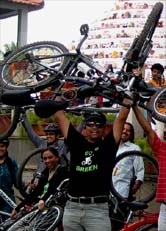 Bangalore Critical Mass May 2010 - GGI-Group size: 4000+ Professionals, Increasing on day to day basis, Come & join us 2 serve Mother Nature. Reached RIS Junction by 3:27pm. 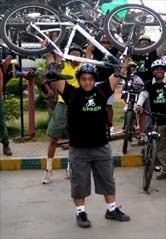 We had 3 new people who joined the ride Rajesh with his new bike, Sanjay from Jaynagar 4th T-Block and Tarun from BTM. While we were waiting for Rajaram, We got a very bad news that Rajaram's 2 months old bike was stolen from his compound wall.. He took out the cycle to ride to CM meanwhile realized some thing was missing and just gone inside, The movement he came out the Cycle was missing... What a loss .. To all the group members Cycles r not safe in u'r own Compound too.. until u have a watch man or a watch dog.. finally we started off by 3:50pm ..
We reached Cubbon park by 4:30pm where Satish,Krishna,Lavayana, Das & others were waiting for us..
Day by day we r loosing out crowd attending CM.. I think we need to seriously think of doing some thing so that we can get back the whole of crowd to action at least monthly's once.. We discussed about how each one of them should make a commitment of participating & contribute to the community We wanted to check with each one of them if the Day & timings is not suitable then will do the changes as required however we will call out for polling then conclude..
Had good time going down to Radio Mirchi but got stuck in the rain for almost 45 Minutes overall everyone enjoyed the ride.. 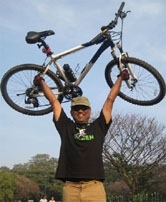 Following was the route that was taken..
flyover - lavell Road - Jewels De paragon - Cubbon park - Bangalore Press Club.